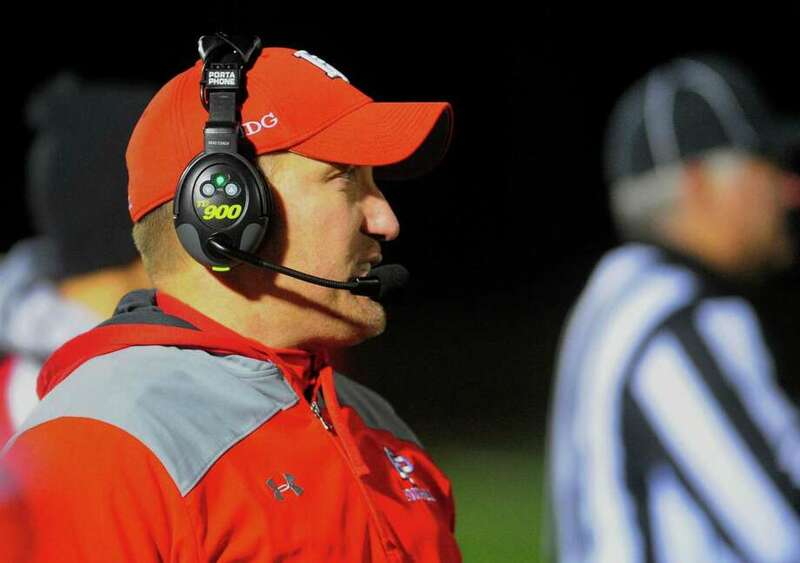 Fairfield Prep coach Keith Hellstern is seen on the sideline during football action against North Haven in Fairfield on Nov. 10. Two storied programs, three championships apiece. Two heralded offenses with a lot of weapons. Two defenses that might be underappreciated. The Jesuits’ defense has held teams to an average of just under 11 points in 10 games, going 9-1. They held No. 3 Shelton, the top seed in LL and a possible semifinal opponent for Tuesday’s victor, to 10 points, the Gaels’ lowest output this year. And the offense has put up at least 23 points in every game except that 10-7 loss to Shelton on Sept. 21. “I think it’s the overall energy” that makes Prep’s offense click, senior lineman Campbell Halloran said. And that sounds familiar: No. 6 Southington scored at least 21 points in all 10 regular-season games, all of them wins. The Blue Knights allowed just over 11 points a game; like Fairfield Prep, they recorded two shutouts. Four wide receivers (three of them 6-foot-2, the other 6-0) have caught at least four touchdown passes from quarterback Jacob Drena, who has thrown 28 in all. And running back Tanner LaRosa has reached the end zone 13 times. The Jesuits made the playoffs last year for the first time since losing to Southington in the 2013 Class LL championship, before any current Jesuits or Blue Knights players arrived. The team they squeezed out by 20 points for the last playoff spot: Southington, which sat out the postseason for the first time since 2011, a run that included two Class LL titles. “We’re just about where we want to be at this point of the season,” Drury said. “In the playoffs, undefeated, it’s a great accomplishment. Drury sees in the Jesuits a disciplined, physical team with weapons that can make an opponent pay. Kavanaugh, in the Blue Knights, noted that corps of big wide receivers. Halloran said he expects a good game. “The game’s going to come down to who plays harder. I’m obviously going to put my money on our team.